This book was a gift that I sent to my Great Grand kids. A Tale of Two Cities is a historical romance set before and during the French Revolution. English author Charles Dickens (1812-1870) has woven together an intricate plot, memorable characters, and vivid imagery to create a great story set during tumultuous times. Dickens has also captured the sense of desperation and resentment felt by the French people before and during the French Revolution. 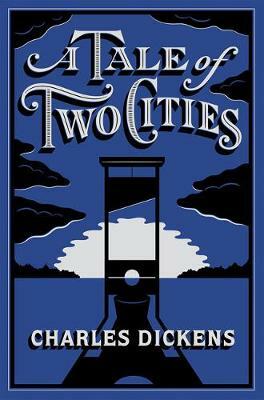 In sum, A Tale of Two Cities is a gripping book about love, sacrifice, and unselfishness. Highly recommended. This was one of the Barnes & Noble Classics in a small hardcover. Great size and nice book. As for the story, its OK but no classic in my book. It is amazing, it is powerful, it is beautiful. It is daunting, it is worth it. It is incredible. From Sydney to Lucie, the charactres shine. The plot is occasionally difficult to follow, but not in a I Am So Lost sort of way. A definite need-to-read. Gives the reader a sense of the cause, effect, consequences and aftermath of the French Revolution and introduces you to heroic personalities.